Dionicio Rodriguez worked on many faux bois projects across several states during his career from the 1920s through the 1940s. Today his work can be found at various sites in Texas, New Mexico, Arkansas, Tennessee, Illinois, Michigan, West Virginia, Maryland, Washington, D.C. and in Mexico. For several years, I have been traveling and documenting his work and on this page are some of the photos of his enduring and incredible imagination. That his work has remained relevant for almost 100 years, surviving changing tastes and the elements while still fascinating and entertaining viewers is testimony to his universal appeal and talent. On more than one occasion one must remind themselves that what they are looking at is actually the end product of a masters creative efforts to recreate nature in a highly personal way. To see his works in Memphis press here. The Old Mill at T. R. Pugh Memorial Park in North Little Rock, with its incredible grounds was constructed by Rodriguez between 1932 and 1936 for developer Justin Mathews three new subdivisions in the city. The work Rodriguez completed also included faux bois sculptures in Lakewood and Crestview Park. This innovative development also is compromised of six lakes in and around the area adding great ambiance to what could have been yet another ordinary development. The Old Mill is perhaps most famously know for its starring role in the opening scenes of the movie Gone With The Wind. The tranquil setting of the Mill, which is set in a low valley with rushing water and surrounded by the incredible fantasy created by Rodriguez, must be experienced to be fully appreciated. No matter where you look there is a wealth of imaginative work adding to the experience. Lakewood Park is the second park in North Little Rock where Rodriguez worked his magic of transforming ordinary cement with his simple tools into a faux bois fantasy with its palapa, twisted limb bridges and large hollow logs. Crestview Park is the third park in North Little Rock and of the three, the one in most in need of repair. Here Rodriguez only created two elements in the park, a covered picknic area and a bridge. A third element is a metal faux Chinois picknic pavilion of a more contemporary design. 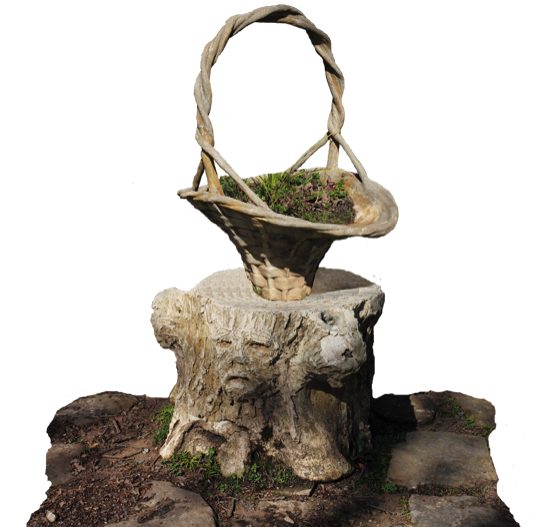 Originally, the now two seperate sculptures of the stump with faces and the basket were one piece. The basket was mounted on top of the stump and planted with flowers. Over the years the two were seperated and remain so to this day.